Alarm Will Sound’s 1969 at Zankel: What Is a Musician’s Responsibilty to Society? It’s an exciting time to be in New York–so much new music of the uncategorizable, genre-mating, mash-up, remix sort that is at least a very big part of the future of classical music. The Ecstatic Music Festival at Merkin, the amazing Tully Scope festival, the Tune-In Music Festival at the Park Avenue Armory, the contemporary classical events at [le] poisson rouge, and other independent events . . . I’m still trying to get everything I’ve been to so far written about. Three video screens–one on each side of the stage, and one above the orchestra, conducted by its artistic director, Alan Pierson. 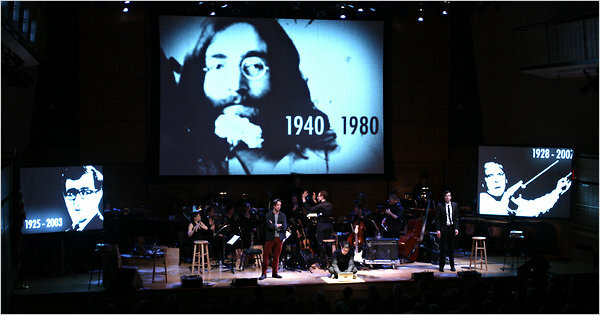 Three professional actors, playing John Lennon, Luciano Berio (another major avant-garde composer of the time), and Stockhausen. Members of the ensemble speaking, acting, and singing; bassonist Michael Harley was particularly impressive singing selections from Leonard Bernstein’s Mass, and also played Lenny himself. Video footage and/or projected stills of of Lennon, Nixon, Berio, Stockhausen, Bernstein, Vietnam-War scenes and protests, Martin Luther King, Jr., Robert Kennedy, FBI files, Daniel Berrigan and others, etc. Music by The Beatles, Stockhausen, Berio, Gavin Chuck, John Stafford Smith (who wrote the tune used for “The Star-Spangled Banner”) as arranged by Jimi Hendrix and then Miles Brown, Miles Brown himself, Kennon/Ono, Robert Dennis/Peter Schickele/Stanley Walden (a number from Oh! Calcutta! ), and the world premiere of Swimming (a mash-up itself of Berio, Bernstein and the Beatles) by Stefan Freund (Alarm Will Sound’s cellist, a composition professor at the University of Missouri). An enormous sixties-like collage of music, images, and performance art, most of the music presented in excerpts, much with talking, acting, video happening at the same time. Genres and artistic disciplines melded indeed. I turned eleven in 1969. I remember vividly watching from Royal Oak the smoke of the Detroit riots of 1967 (and the insensitive racism of some of the white, supposedly-liberal suburbanites in my parents’ circle of family and friends–“the niggers are burning down their own neighborhood,” one of my uncles would laughingly quote another relative for years after). The King and Robert Kennedy assassinations in 1968. The fear and anger over the Vietnam War. The hippie movement. The idealism of the peace movement. That powerful mix of fear, anger, and idealism. It came across so well in Thursday’s 1969, so potent in comparison with today’s apathy. Berio, in this production, constantly harping on the composer’s responsibility to society. Bernstein proclaiming “a new eclecticism is at hand,” perhaps forty years before it really began to take hold among what appears to be a critical mass of today’s young classically-trained, rock-loving composers. Lennon, “Politics bores me,” inviting people to relax, love, and imagine. What an enormous, complicated undertaking to develop, plan, and execute this! An amazing adventure, a magnificent experiment. Steve Smith reviewed it for the NY Times (as soon as I finish this post I’ll let myself read his piece), as did Kevin Berger for the LA Times and NY law professor Arthur Leonard on his blog. My personal reaction? As amazing as it all was, as a theater piece it lacked dramatic focus, and the large number of non-professional actors acting was, at times, distracting. I kept thinking, “Oh, it’s a musician reading these lines. Pretty good job” Same thing with much of the instrumentalists’ singing; some was fantastic, some strained. At intermission and after, people (at least the ones I talked to) were talking about how surprising it was that such and such a player could sing so well, rather than about what they sang. Musically it was a big mash-up. At times I wanted more sense of musical structure and cohesion, but quite obviously the mixed-up, kaleidoscopic array was much of the point, and very much in keeping with the late-1960s spirit. There was a bit of self-important pomposity about it, also in keeping with the spirit of the late-sixties Lennon, Stockhausen, Bernstein, Berio, et al. It felt, to me, more than a bit preachy. The significant amounts of non-professional-level singing and acting reminded me, at times, of a really good, extremely high-budget amateur or student production. Incredible energy, idealism, and enthusiasm. The video work and sound production was amazing. The audience loved it. I’m fascinated by it and the extraordinary creative process that produced it. I’m thrilled that Carnegie Hall presented it–a major venue embracing something new and experimental. And most of all, I’m grateful to have attended it. Since I left the performance, I’ve been asking myself what a musician’s responsibility to society is in times like these, in times like those. And what does that have to do with how people like me teach and train young musicians? An evening that produces a shift like that is an evening more than well spent.